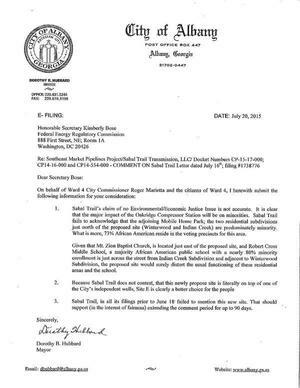 This is See also the Dougherty County Commission letter referenced in the WFXL news story. 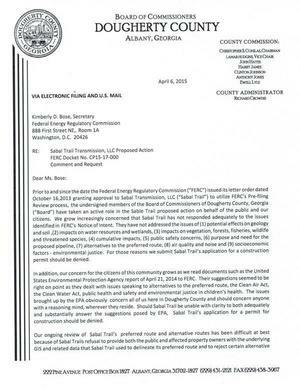 Remember, you can still ecomment to FERC and ask Governor Deal to oppose Sabal Trail like he opposes the Palmetto pipeline. They have not addressed the issues of (1) potential effects on geology and soil, (2) impacts on water resources and wetlands, (3) impacts on vegetation, forests, fisheries, wildlife and threatened species, (4) cumulative impacts, (5) public safety concerns, (6) purpose and need for the proposed pipeline, (7) alternatives to the preferred route, (8) air quality and noise and (9) socioeconomic factors – environmental justice.